Service. This is the second mandate of our mission or purpose as a Christian community in the Presbyterian tradition. Thus, Southminster fosters activities and attitudes in our congregation that emphasize God’s call to us to make a difference in the world through serving others and by reminding others of God’s offer of salvation through Jesus Christ. How is God calling you to serve or volunteer? Click here for some discernment resources. We have a partnership where Southminster members volunteer their time and treasures assisting in classrooms, weekly reading on Tuesdays with a student during the lunch hour [Readers Cafe] and helping with administrative projects. ACAP’s mission is to encourage people with disabilities to achieve their highest potential and acquire life-long skills which will enable them to become contributing and valued members of their communities. Hope Center is a ministry committed to serving people in need in Waukesha County by offering a wide range of services to address the needs of food, clothing, housing, child care and job training. Healing Hearts of Waukesha County, Inc. (HHWC) is a community based collaboration of organizations, faith based institutions, businesses and individuals who are committed to supporting children and families experiencing grief. Southminster is a founding member. Recognizing that hunger exists in our community, the Food Pantry seeks and collects donations to provide groceries to Waukesha County individuals and families in need while respecting individual dignity. A local non-profit organization that shelters women and children who are displaced because of violence in the home. Over the past 18 years Southminster has been instrumental in building 15 bridges and 16 schools. The lives of many thousands of people have been improved due to efforts and donations from Southminster. CWS is the relief, development, and refugee assistance ministry. Four churchwide special offerings providing congregations direct ways of supporting specific causes that help those in need. 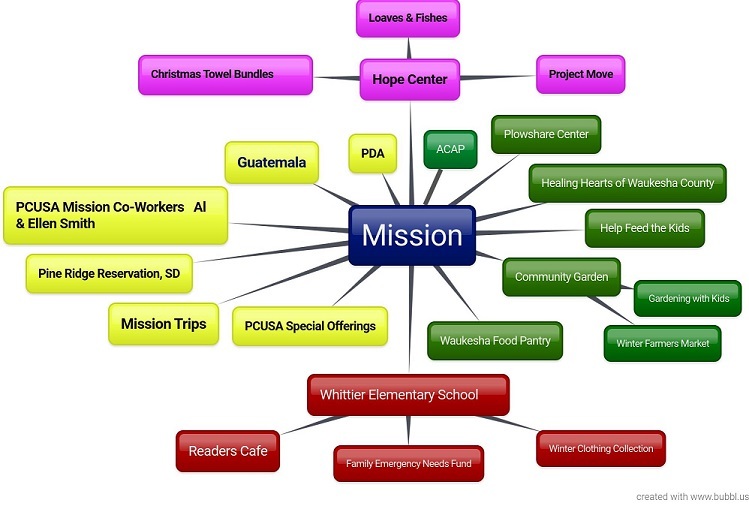 PDA is the emergency and refugee program of the Presbyterian Church U.S.A. Ferncliff is a 10,000 sq ft Disaster Assistance Center (DAC) that works in cooperation with Church World Service (CWS) and Presbyterian Disaster Assistance (PDA).